از ارکان اصلی سیاستهای تولید علم و توسعه فناوری یک کشور ارزیابی منظم فعالیتهای مربوط به آن است. سطح و میزان فعالیتهای فناوری را می‌توان برای یک کشور و در سطوح مختلف بین‌المللی، ملّی و برای مؤسسات فناور شامل پژوهشکده‌ها و مراکز رشد و فناورانه و در آخر برای فعالیتهای افراد فناور شناسایی و ارزیابی کرد. نتایج این ارزیابی می‌تواند به بهبود عملکرد و در صورت نیاز بازنگری مستمر اهداف، ساختارها، روشهای اجرایی و از همه مهم‌تر اصلاح روشهای متناسب آموزش مهندسی با نیازهای فناوری کشور و تحولات جهانی منجر شود. 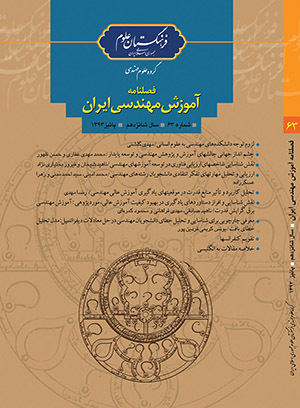 در این مقاله با معرفی شاخصهای ارزیابی فناوری در سه سطح کشوری، مؤسسه‌ای و فردی، ارتباط مستقیم یا غیرمستقیم بین ارزیابی با توسعه و بهبود آموزش مهندسی بررسی شده است. راهکارهای به دست آمده از این نتایج می‌تواند سبب توسعه آموزش مهندسی در کشور و جهتگیری آن به سمت تربیت مهندسانی با تواناییهای فناورانه بشود. 1Industrial Engineering and Research Center of Amirkabir University of Technology, Tehran, Iran. The main element of the policy of science and technology development is regular evaluation of the relevant activities. Level and scale of technological activities in a country at different levels of international, national, and for the technological institute that concluded research centers, incubators, and for activities of technologist can be assessed. The results of this evaluation can lead to improve performance and, if required pursuant ongoing review aims, structures, procedures and the most important to reform methods of engineering education tailor to the needs of technology of the country and global developments. In this paper, we introduced the technology assessment indicators for three levels of national, institutional and individual, Direct or indirect relationship between the development and improvement of engineering education assessment. is studied. The results could help to develop strategies of engineering education in the country and its orientation towards the education of engineers with technological capabilities.